Algorithm Trading: A New Rage among Investors Today, algorithmic trading is quite a rage among the institutional investors and accounts for around 3540 percent of turnover on the world exchanges. Algorithm trades are the orders that are executed on the exchange platform by computers through a program designed by the user. Algorithmic trading software can involve different degrees of manual intervention. However, in zero-touch algos, a program spots the trading opportunities and implements it also without any manual interference. While the terms algorithm trading and high frequency trading is often used inter-changeably, but they are not really the same. High Frequency Trading exemplify the high-volume orders executed within splitseconds in order to achieve immediate gains from different market opportunities. High frequency trades are often supported by algos, which identifies the potential trading opportunity. The success of most algo trading strategies is dependent on the speed of execution, which in turn rests on the bandwidth of the connection and also the distance the data packets have to travel. Why is Algorithmic Trading Important? 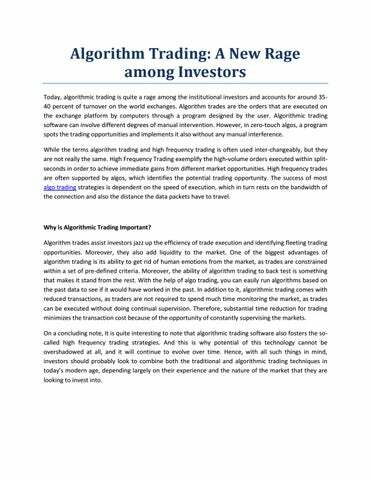 Algorithm trades assist investors jazz up the efficiency of trade execution and identifying fleeting trading opportunities. Moreover, they also add liquidity to the market. 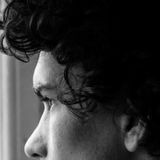 One of the biggest advantages of algorithm trading is its ability to get rid of human emotions from the market, as trades are constrained within a set of pre-defined criteria. Moreover, the ability of algorithm trading to back test is something that makes it stand from the rest. With the help of algo trading, you can easily run algorithms based on the past data to see if it would have worked in the past. In addition to it, algorithmic trading comes with reduced transactions, as traders are not required to spend much time monitoring the market, as trades can be executed without doing continual supervision. Therefore, substantial time reduction for trading minimizes the transaction cost because of the opportunity of constantly supervising the markets. On a concluding note, it is quite interesting to note that algorithmic trading software also fosters the socalled high frequency trading strategies. And this is why potential of this technology cannot be overshadowed at all, and it will continue to evolve over time. Hence, with all such things in mind, investors should probably look to combine both the traditional and algorithmic trading techniques in todayâ&#x20AC;&#x2122;s modern age, depending largely on their experience and the nature of the market that they are looking to invest into.